We have been spending the last two weeks with three clients from Texas who have more than just a casual interest in history, philosophy, art and literature. So it was a natural to make a stop at the Vorau Augustinian Monastery at Vorau, about an hour and a half south of Vienna. The library is in original condition back to 1721 with no painting, special cleaning or anything else having been done to it since then. 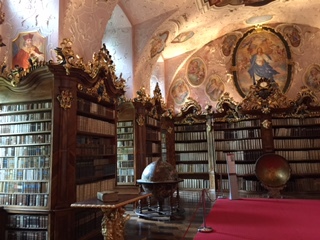 We had a private tour from the porter lasting more than 90 minutes through the high baroque church, the sacristy and the library. The library is where we spent most of our time. The library is in original condition dating back to 1721. This is amazing considering the many wars to have passed through this region since that time. In World War 2 the entire complex was bombed by the Russians, and most of the monastery was burned to the ground. Amazingly, the church, the sacristy and the library survived practically without any damage whatsoever. Inside the library one finds some of the more than 11,000 volumes held by the Augustinians dating back to the earliest book from around 1150. Two large globes by Italian cartographer Coronelli are on display in the library. They are in perfect condition, another amazing fact considering they were done in 1688. One shows an astrological chart of the heavens complete with the associated animals and persons. A recent test by an expert from Germany confirmed that the stars are in their exact and correct positions. 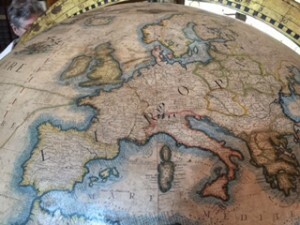 Another globe shows the earth as it was known in 1688. 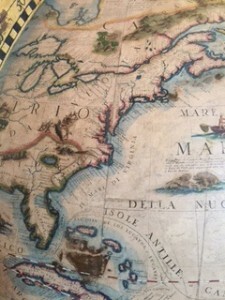 The coastline of the eastern United States is incredibly accurate, another wonder considering that this was achieved through piecing together many, many sketches of coastline from various mariners. California is another story entirely. 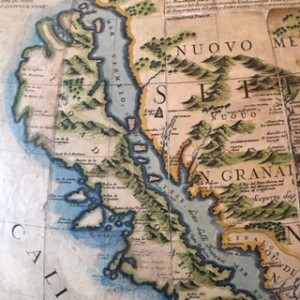 The area is shown as an island, a common misnomer that was passed along from cartographer to cartographer who were in the most case too lazy to check their facts! Posted in Austria Tours and tagged augustian, austria, custom, designed, europe, guided, in, monastery, private, tours, trips, vorau.